By Gordon Giltrap , arranged by Raymond Burley. Book. 16 pages. Published by Registry of Guitar Tutors. (1898466491) ISBN 9781898466499. 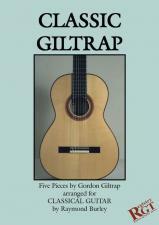 Gordon Giltrap is one of the UK's most accomplished fingerstyle guitarists and his instrumental compositions are highly regarded. In this collection, classical guitar master, Raymond Burley has taken some of Gordon's most attractive pieces and arranged them for the classical guitar. In these well-crafted arrangements, Raymond has taken advantage of the unique timbre and resonance of the classical guitar to explore the innate subtle nuances, and bring out the special musical character, of the pieces.